As the owner and chef extraordinaire of the popular Dooky Chase restaurant in New Orleans, Leah Chase has distinguished herself as a community and civic leader through her dedicated involvement with numerous charities and organizations. The preeminent chef in the Dooky Chase kitchen, Chase has established a reputation as one of the best masters of Creole cuisine in the nation. Leah Chase was born in rural Madisonville, Louisiana, and moved to New Orleans at the age of eighteen. After working briefly in a laundry in the French Quarter, she found a job at Colonial Restaurant on Chartres Street. It was the first time she had ever seen the inside of a restaurant. Over the years, as Chaseâ€™s expertise and popularity grew, she was able to exert more influence upon the cuisine and atmosphere at Dooky Chase. She successfully grafted her country roots, both in ethics and food, to the black Creole tradition of the city, and the restaurant soon became a reflection of Chase herself and of the black community as a whole. Leah Chase is a recipient of the Southern Foodways Allianceâ€™s Lifetime Achievement Award. 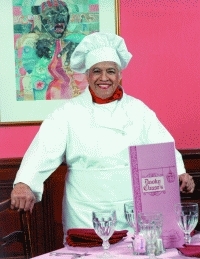 In 2009, the Southern Food and Beverage Museum created the Leah Chase Louisiana Gallery in her honor. A portrait of her at work in the kitchen by Gustave Blache III titled Cutting Squash hangs in the National Portrait Gallery in Washington, DC. Leah Lange Chase was raised in a small, country town across Lake Pontchartrain from New Orleans. With the values instilled in her by devoted parents—hard work, faith and family—she soon grew into a woman to be reckoned with. In her roles as chef of the most popular Creole restaurant in New Orleans, nationally respected patron of the arts, and civic leader, she has influenced the world around her in important ways. Reading her story makes one think, “If she can do it, maybe I can too.” Hardcover. Esteemed Creole chef, patron of the arts, and civic leader, Leah Chase is a distinguished inspiration to all. As an African American woman raised in rural Louisiana, she boldly broke through racial barriers to become the owner of the renowned Dooky Chase restaurant, an establishment frequented by celebrities. With her faith and hard work, she continues to succeed in her culinary career while garnering admiration from her peers. Born in 1923, Chase is a living legend known for popularizing Creole cuisine, an advocate for African American equality, and an outspoken voice in politics. While contributing to both the black and white communities of New Orleans, she raised four children, grieved the loss of a daughter, and survived a bombing during the Civil Rights era. Based on her own words, and reflections of others, this biography, which is narrated by her, reveals Leah Chase—a woman of integrity, talent, and ambition. 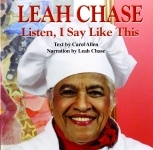 Four Audio CDs, read by Leah Chase.